On December 15, Imagine! 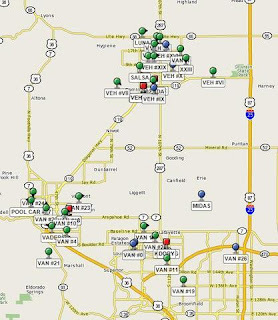 launched a new pilot project to test an online fleet tracking tool, hosted by Verizon Networkfleet. Vehicles used throughout our CORE/Labor Source and Out & About programs are participating in this project. This means that during this pilot project, more than half of the vehicle fleet that we operate is now monitored 24 hours a day, 7 days a week. This program allows us to track our fleet, locate the nearest vehicle to a specific location to better maximize fleet utilization, gather data to map and test more efficient travel routes, as well as providing 24/7 roadside assistance. This tool also provides data regarding current engine diagnostic trouble codes, fuel economy, greenhouse gas emissions records, odometer readings, and records details of all trips that each vehicle makes. One unique use of this monitoring tool is that we’re currently sharing vehicle diagnostic trouble codes via text and email alerts with the mechanics who maintain our fleet, to help prevent avoidable vehicle breakdowns for staff and people accepting services from Imagine!. This program allows real-time analysis of all aspects of fleet management. Based on this year’s performance, Imagine! may choose to expand this technology to include the entire fleet in FY17.